These 10 teams shocked the world by not qualifying for the 2018 FIFA World Cup. 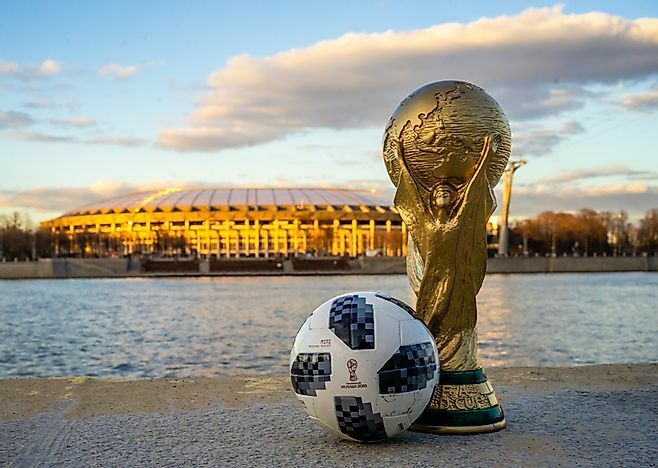 The FIFA World Cup is a soccer tournament that involves senior national teams that are a part of the Fédération Internationale de Football Association (FIFA). The tournament has been held every four years since 1930 except for the periods during the Second World War in 1942 and 1946. The 2018 edition is being held in Russia from June 14 to July 15 of 2018. There are a total of 32 teams with 31 playing it out in qualifying stages while the hosts get automatic qualification. However, there are some teams in the world that have graced the tournament for years on end that shocked the world when they failed to qualify this year. Gareth Bale, Aron Ramsey, and other star names come to mind. After a blistering performance at the Euros, Wales should have qualified for Russia. The team came close under manager Chris Coleman but injuries to one of the best players in the world, Bale, curtailed their progress. However, one should not rule Wales out as they will definitely be back in the next Euros and World Cup. Led by Michael O’Neill, this team had all the signs of qualifying. After finishing a respectable second to world champions, Germany, all they had to do was keep their cool and grind out a result against Switzerland. However, their tactics were neutralized by an energetic Swiss side featuring the likes of Xherdan Shaqiri who went on ahead to win. A disappointing result for O’Neill’s men overall after all the hard work they did but a good sign for things to come. After three successive qualifications in past World Cups, this team is nothing like it used to be. Previous star names like Didier Drogba, Yaya Toure, and others elevated the team to heights never seen before. This situation is almost similar to Ghana’s with disappointing losses to teams like Gabon. In the Oceania Football Confederation, New Zealand had it easy. With star players like Chris Wood, New Zealand easily beat out the likes of New Caledonia. Consequently, New Zealand qualified for the inter-confederation playoff against Peru. Unfortunately, they failed to capitalize on home advantage and succumbed to defeat in Lima. The team also had some poor performances in the Confederations Cup. The Black Stars are Africa’s golden boys. The most memorable performance was the astonishing run during the World Cup in 2010 where they lost to Uruguay. However, this time the team is a shadow of the past after disappointing home results and an ageing squad with few future prospects. Internal feuds among leaders are also not helping. After winning the recently concluded African Cup of Nations in 2017, the Indomitable Lions should have qualified for Russia. In fact, they won the African cup without star players like Joel Matip. Most of the star players who were not available before were available during the qualification and they still failed. Cameroon has played in seven of the last nine contest which comes as a shock for them to miss out. With one game left to play in the qualifiers, Cameroon had won only one of their first five games. A mention of Chile brings to mind star names like Alexis Sanchez and Arturo Vidal. These two have powered Chile in the past to astonishing results like the Confederations Cup just a year ago where they lost to a younger German side in the final. After such a glamorous campaign, everyone expected Chile in Russia in 2018. A string of losses in the final games, most notably to a comparatively weak Bolivian side, and a couple of results in other matches also contributed to their elimination. At some point, the US did not even entertain thoughts of playing the World Cup. However, times have changed as the sport has grown even more popular in the US. Within their region, the US needed to overcome much weaker teams like Panama, Honduras, and Trinidad and Tobago. However, some questionable tactics in playing aged players like Clint Dempsey and ignore budding talent like Matt Miazga by manager Bruce Arena means they are out. A bigger picture shows that the decline has been there with the US struggling for qualification in 2006 and 2010. Nicknamed The Oranje, the Netherlands is another team with a pedigree few teams will ever have. With star names in the team like the pacey Arjen Robben, it is hard to tell why the team didn’t qualify. Among soccer fans, Netherlands is the best team that has never won this cup because of the number of times they have reached the final and lost. The team did it in 1974, 1978, and again in 2010 with losses on all three occasions. After a poor run of games in the qualification stages, they found themselves tied with Sweden who had a superior goal difference. For the team to have qualified, they needed to beat Sweden by at least seven goals to nothing. The Oranje got only two goals, both of them by Robben. A similar thing happened when they failed to qualify for the cup in 2002. Italy failing to qualify is arguably the biggest shock of 2018. For the first time in 60 years, the mighty Azzurri were humbled after a string of poor tactical choices by the manager. In fact, the whole situation can be pinned on the football association of Italy for going after Ventura as manager in the first place. An old school and stubborn manager, Ventura also lacks the charisma and verve that his predecessor, Chelsea’s Antonio Conte, has on the touchline. Senior players such as Daniele De Rossi and Giorgio Chiellini also had a mutiny that meant Ventura’s reign was doomed. In addition, his poor use of technically gifted players like Lorenzo Insigne and Jorginho means that the four-time World Cup Winners, second only to Brazil with five wins, will not regale us in Russia this year. One cannot also ignore that Italy has been on the decline for years ever since winning the cup in 2006 and then disappointing terribly in the cup in 2010 and 2014.